This year’s annual Italian Heritage Festival will be held Saturday, September 21, at Shelter Cove Community Park, from 11 a.m.-4 p.m. With activities such as stickball, food prep demonstrations, Bocce demonstrations, dunk-tank, grape-stomping, silent auction, genealogy/Italian heritage booth, and both live Italian music and local radio coverage by 104.9 The Surf, the day-long festival is expecting in excess of 5,000 ticket sales. With that in mind, this is also the last year it will be a one-day only event, with plans in the making for 2014 to be a three-day extravaganza. In addition, 2014 plans call for a new event, an Italian Opera Weekend (dates TBD) in which regional Italian-American clubs (Atlanta and Charleston) may also partner. 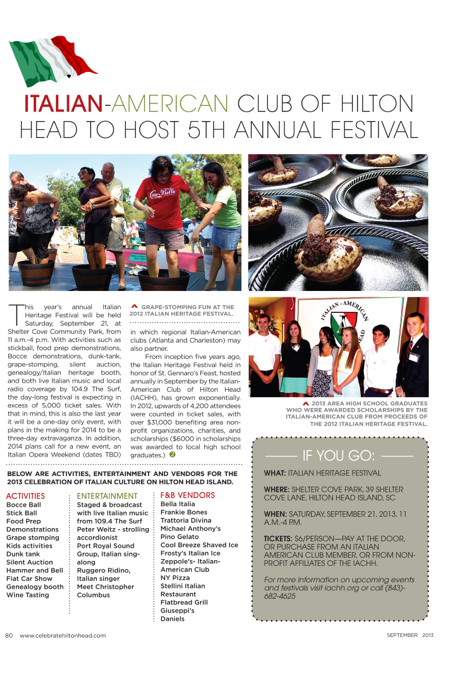 Below are activities, entertainment and vendors for the 2013 celebration of Italian Culture on Hilton Head Island. When: Saturday, September 21, 2013, 11 a.m.-4 p.m.
Tickets: $6/person—pay at the door, or purchase from an Italian American Club member, or from non-profit affiliates of the IACHH.